- The 2015 SoBRO Black & White Benefit Ball. A Bronx Tale: Stories of our Past. Present. Future. The buzz of the growing Bronx and Upper Manhattan economy is electric, and city-wide, residents with ideas of striking out on their own and laying claim to the many opportunities and programs available are reaching out to SoBro’s Entrepreneurial Assistance Program (EAP) to help them do it. Entrepreneurs from every industry, experience, and background—from home health attendants to those with advanced degrees, come to SoBro’s EAP to develop, grow or expand their business acumen as well as get plugged into the tremendous networking opportunities that come from participating in the courses. Since its beginning in 1987, SoBro/EAP has assisted over 150 entrepreneurs to start and grow more than 100 small businesses, creating 300 jobs. In November 2017, Paul Sawyer joined SoBro/EAP as its Director after a career in business development spent accruing expertise and firsthand experience running several businesses, as well as bringing an astute knowledge about city and state politics and the city’s economic landscape to bear–which he shares with great skill and passion. Working together with Program Specialist, Jaran Manzanet who runs the SoBro/EAP Venture Center, designed specifically to assist Spanish-speaking entrepreneurs, Mr. Sawyer is out regularly attending community board meetings and networking events throughout the city to gain up-to-the-minute insights into business and economic factors impacting business development and which leads him to be better able to guide entrepreneurs to the best places to set up and establish their businesses. “We are solidly about the business of creating successful businesses and assisting those businesses to be able to create meaningful job opportunities.” Read More.. 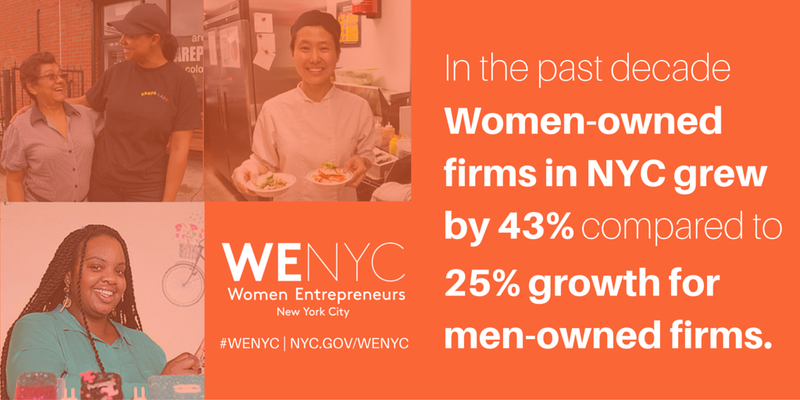 Since 2016, Mayor Bill de Blasio and Governor Andrew Cuomo have continued to increase their commitment to strongly support the success of minority- and women-owned businesses (M/WBEs) in New York and to increase contracting opportunities, with Mayor de Blasio creating the Office of M/WBEs and appointing a Deputy Mayor for Strategic Policy Initiatives in an ambitious goal of awarding at least 30 percent of the dollar amount of City contracts to M/WBEs by 2021. SoBro’s Procurement Technical Assistance Center (PTAC) partnership has been working since 1991 to support city entrepreneurs with the assistance needed to navigate the competitive road to growing their businesses by obtaining certifications qualifying them for these city, state, and federal government contracts–a process in which it is easy to become lost or discouraged. In 2010, Bronx-born entrepreneur, Linder Washington, came to SoBro/PTAC with her sights set on expanding her janitorial services company. She’d begun her home-based business in 2007, and after attending a city workshop, she was referred to SoBro in 2010 by a Small Business Administration (SBA) administrator. At that time, she had a couple of successful and happy clients, two full-time employees, and the determination that she would see her company grow. She brought her very simple business plan to Evangeline Gelladola, SoBro Assistant Vice President of Procurement and MWBE Programs, who urged her to think more concretely about her goals for her business, afterwhich Ms. Washington was able to write a robust and winning business plan and returned to follow the next steps of preparing to become MWBE-certified to take advantage of local government contract opportunities. Working with SoBro/PTAC, Ms. Washington obtained New York city and state MWBE certifications, as well as her System for Award Management (SAM) registration in October 2011. Read More..
Jobs to Build On… Moving Forward and Up! Over the last decade, the New York City Council has helped 20,000 NYC residents get a great job through the Jobs to Build On (JtBO) program; 85% of participants are people of color and 60% are women. Of the courageous and determined participants in the SoBro/JtBO program collaboration, we didn’t have to look too far to see a particularly shining result of the initiative than SoBro Business Analyst, Shameeda Bachus. In September 2017, Shameeda found herself six months into Read More..
SoBro YouthBuild: Going Up! Growing Up! The young adults pictured above were selected to be members in the 2018 SoBro YouthBuild Construction Program cohort after completing a vigorous assessment of their academic and analytical skills, skills critical to fulfilling the demanding responsibilities of working at a real construction site. SoBro prepares every YouthBuild participant to successfully complete the 30-hour OSHA Safety requirement as well as earn the sought after National Center for Construction Education & Research (NCCER) certification Read More..
SoBRO’s Compass SONYC youth were invited to attend Mayor Bill de Blasio’s town hall meeting to participate as an exemplary of New York City’s Department of Youth and Community (DYCD) programs being awarded for three consecutive years in a roll. DYCD invests in a network of community-based organizations and programs to alleviate the effects of poverty and to provide opportunities for New Yorkers.Youth participants along with SVP, Johanna DeJesus, and Director, Jason Garcia were both delighted to meet Mr. Bill de Blasio, and Danielle Motindabecka was honored to recite the Pledge of Allegiance before the commencement of the meeting. Also in attendance were Council Member Bill Perkins, Manhattan Borough President Gale A. Brewer, U.S. Representative Adriano Espaillat, State Senator Brian A. Benjamin and Assembly Member Inez Dickens. Pledge of Allegiance reciter, Danielle Motinbecka started the after-school Compass SONYC program in the sixth grade at the Thurgood Marshall Academy for Learning and Social Change. The program quickly became her safe haven as she has been reared isolated and sheltered away from the norms of the American society. Her parents, who are from the Democratic Republic of the Congo (country in Central Africa) and French-speakers only, have always been protective of her and were relieved when Danielle found a place where she could flourish, be herself and own her voice. Since joining the program, Danielle has rid away her shyness and passivity, and actively participates in all facets of the after-school program; dance, theater or Broadway Juniors, music productions, homework help, tutoring, and STEM themed activities. She’s slowly become the pioneer of her young life and even joined Thurgood Marshall’s Student Council. Initiated in 2015, “The Bronx Salad” was a direct response to the Robert Wood Johnson County Health Rankings Report that placed the Bronx in the last place, 62 out of 62; the unhealthiest county in New York. This also sparked Borough President Diaz’s health initiative #NOT62; a Campaign to improve health outcomes for Bronx residents by 2020. The Bronx Salad Project is a collaboration between SOBRO, the United Business Cooperative (UBC) and the Bronx Health REACH. After sampling several salads, the Bronx Salad was selected by a community vote, its ingredients illustrating a cohesion of ethnic flavors that represent the diversity of the borough. The harvesting of the salad ingredients is conducted on a local youth-led hydroponic garden, with the remaining ingredients locally sourced. The salad made its first debut at the 6th Annual Savor the Bronx Restaurant Week in November 2016, and its second debut during New York City’s Restaurant week in January 2017. The Bronx Salad is being offered at Mott Haven Bar and Grill, Delmys, Don Pancho’s Steak House, Viktoria Italian House, Camaguey, and all Delicioso and Mexicosina restaurant locations in the Bronx. It is our pleasure to feature Women Entrepreneurs NYC (WE NYC) in our newsletter this season, an initiative based out of the New York City Department of Small Business Services dedicated to helping women start and grow their businesses by offering tailored developed programs and tools that are essential to connecting women with the resources, education and community needed to thrive. Classes are offered in English, with some offered in Spanish, French, and Mandarin. On July 13th, SoBRO joined Frank Pimentel’s second Fine Fare Supermarket Grand Opening in the Melrose section of the Bronx at the 149th Street and Brook Avenue location. The new 14,000 square foot Fine Fare creates a new place to grab lunch in the once “food desert” area as they have an extensive 5,000 square foot fresh produce department, a hot and cold salad/fruit bar, in-house bakery, and a butcher shop in addition to standard grocery amenities. Additional notable items were the pre-made packaged salads and sandwiches, Asian food section, naan Indian bread, challah bread, lentil chips, and a section dedicated to organic items. There is free rooftop parking designated for customers only. SoBRO youth handed out “Green Bucks” to residents for the purchase of fresh produce and other healthy alternatives. We’d like to give special thanks to the Office of Community Services (OCS) for their Community Economic Development Healthy Food Financing Initiative Project – FY 2016 that has supported our goal to increase the availability of healthy food options at South Bronx restaurants, support the expansion of businesses providing healthy food options, and facilitating the creation of employment opportunities for Bronx residents. This project has empowered local entrepreneur Henry Obispo to launch his socially conscious cold-pressed juice bar and healthy food eatery BORN Corp.; provided technical assistance to members of the South Bronx’s United Business Cooperative (UBC); and activated commercial and community space at the SoBRO managed Roberto Clemente Plaza. What’s more, Fine Fare’s opening created 25 jobs and BORN’s opening will create 15 jobs. On June 30th, SoBRO’s 14th Annual Golf and Tennis Classic: Fore the love of the Bronx celebrated all of the things we love about this thriving borough. From cultural exhibits, to superb spirits, to an extraordinarily diverse cuisine. We are grateful for all of those who attended to commemorate our longstanding love affair with this amazing community. Supporters enjoyed a day of golf and/or tennis, lunch, stroll, and cocktail hour; culminating with our Champions of Change Dinner. In addition to supporting SoBRO’s life changing programs, sponsors also had the opportunity to advertise, build their on-site /online presence and visibility, network, and increase their industry reach. SoBRO’s mission is to enhance the quality of life in the South Bronx by strengthening businesses and creating innovative economic, housing, educational, and career development programs for youth and adults. SoBRO is a registered 501(c) (3) nonprofit organization. All donations are tax deductible in full or in part. © 2014 South Bronx Overall Economic Development Corporation. SoBRO is registered trademark in the United States of America. SoBRO is an equal opportunity employer/program.